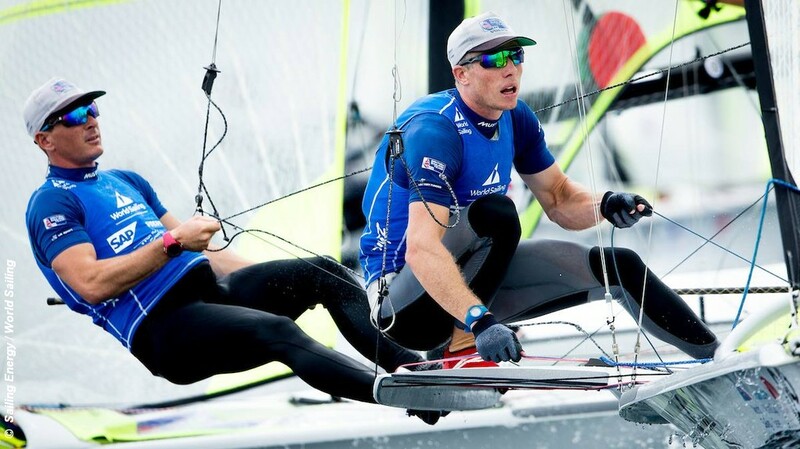 In addition to being front-runners for the British 49er Tokyo 2020 spot, Dylan Fletcher-Scott and Stuart Bithell are competing in the inaugural Sail GP season as part of the Great Britain SailGP team. Straight from winning 49er silver at the Hempel WorlCup in Miami, the British Sailing Team pair jetted off to join the British SailGP team for the first event of the new F50 multihull circuit, which will take place 15-16 February on Sydney Harbour. SailGP F50s of Australia, China, Great Britain, France, Japan and the United States are lining up on the water together for the first time just one week out from the inaugural Sydney race. But how exactly will they balance their Olympic campaign with this new venture? The Great Britain SailGP team comprises: Manager and wing trimmer Chris Draper, helmsman Dylan Fletcher, flight controller Stuart Bithell, and grinders Matt Gotrel and Richard Mason. With Thursday’s race rehearsal, the stage is nearly set for Sydney SailGP, which will see Australia compete against the five nations on Sydney Harbour before the league heads to San Francisco, New York City, Cowes (UK) and Marseille (France), where the champion will be crowned.